It's rare to find a bourbon as old as this one. Many believe that the sweet spot for bourbons is in the 10-12 year range. I tend to agree with that assessment, as I find, unlike with Scotch, that when you get past that 12 year range, the bourbon tends to really take on the wood flavors and dries out significantly. 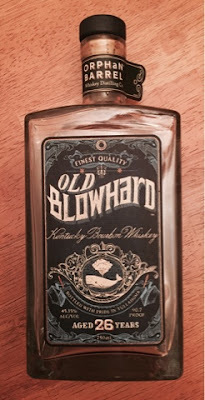 So, when I poured my first glass of old blowhard and put my nose to the glass, I wasn't surprised to notice the smell of oak immediately. Although the wood tones dominated, it also had a sweet, chocolate sent to it as well, which I really enjoyed. On the first drink, while I did not notice the wood flavor as much as I thought I would, it unquestionably comes off as a dry bourbon. The most prominent flavor was a chocolate cherry type flavor, reminiscent of the kind that come in Russell Stover's boxes. Eventually the vanilla works its way to the foreground, and while the chocolate-cherry notes were somewhat fleeting, the vanilla flavor tended to linger in the back of my throat long after I swallowed. The thickness of this bourbon is very noticeable. People typically describe such bourbons as having legs. In this case, these are good, hearty stumps of legs. It's a very chewy bourbon, one that really coats your mouth and throat. I found the bourbon enjoyable enough that I didn't mind it sticking around for a bit afterwards. Plus, at 90.7 proof, there is no significant burn to take away from the mild sweetness that lingered. Calling it a "mild" sweetness may be a bit of an overstatement, though. This bourbon is anything but sweet. It is earthy, woody and tannic. The char flavor dominated this whiskey, and a little more sweetness would have gone a long way to making this a great bourbon. The price point was a bit steep (as is the case for all the Orphan Barrel releases), but given the age and now the scarcity, I can't really ding it much for that. However, I really wanted to find a reason to truly enjoy such an aged bourbon. I wanted it to sweeten up, perhaps have those bitter tannins fade away a bit, and it just didn't happen. It remained a bitter, woody bourbon that almost completely lacked the sweetness I so desire.